Trevor Ashley,, "Dressing-up and creating clothing has been a passion of mine since I was a little girl! I consider myself to be an artist and love creating individual pieces which will be forever treasured! It is my goal to provide a highly personalized service for those who think (and dress) outside the square! There are no rules. Don’t follow fashion…create it!" 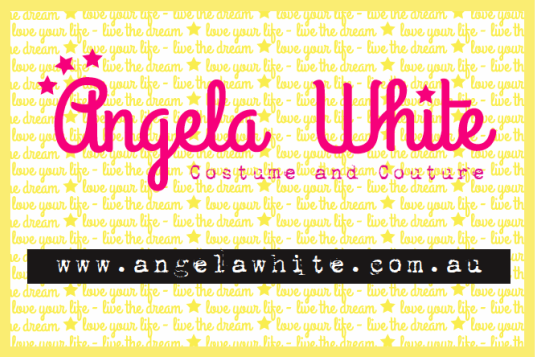 Angela White is an avant garde fashion and costume designer who creates stage performance pieces for pop stars and designs musical theatre shows. Angela won 'Best Costume Design for and Independent Theatre Production' in the 2016 Sydney Theatre Awards for her work in 'Heathers the Musical'. Angela's other biggest achievements include co-designing and making costumes for Jessica Mauboy's 'All The Hits' tour in 2017, co-making Jessica Mauboy's 2018 Eurovision dress and designing and making numerous costumes for Trevor Ashley's sell out shows. Angela has collaborated with musical artists such as Mel B, Courtney Act, Samantha Jade, Havana Brown and Ginger and the Ghost. Angela has worked on television shows: ' Dance Boss', 'The Voice', 'The Voice Kids', 'Dancing With The Stars' and 'Australia's Got Talent' and travelled the outback with Channel Ten’s ‘I Will Survive’. Angela has also worked as a costume maker on many films, television shows and theatre, including: 'Gatsby', 'The Sapphires', 'Disney's Aladdin'. Angela is passionate about the environment and educates people on how to make conscious choices through her Revamped Fashion workshops. Angela encourages people to break away from the destructive cycle of fast fashion and repurpose their clothes to create pieces which project their own personal style. Angela has a Bachelor of Education Degree, a Diploma in Textiles, Clothing and Footwear, and has been working in both the fashion and costume industry since 2006. Angela also teaches private sewing lessons and workshops through Sew Make Create in Sydney's inner city suburb of Chippendale.